Hundreds of thousands of marchers waving red, white and blue Cuban flags filed past the American mission in Havana Tuesday demanding an alleged terrorist remain behind bars. In a short speech of just under 15 minutes, Cuban President Fidel Castro told protestors the Bush Administration wants to free Cuban exile Luis Posada Carriles, blamed for numerous acts of violence against Cuban targets, including the deaths of at least 74 people. Thousands of government printed wanted posters with the faces of both Mr. Bush and Posada bobbed among the protestors. Sometime Tuesday, Homeland Security is supposed to decide what to do with Posada, who has been in immigration custody since May on charges of illegally entering the United States. He could be released, held for another 90 days or deported to a third country. However, there is no guarantee that the decision will come down today. Venezuela filed an extradition petition supported by Cuba shortly after Posada surfaced in Miami some nine months ago. However, Immigration Judge William L. Abbott earlier ruled that Posada could not be extradited to either Cuba or Venezuela lest he be tortured. There is no way to confirm the official crowd estimate of 1.4 million marchers, but people were still pouring down the street chanting "Bush, Fascist. Condemn the terrorist," nearly seven hours after the march kicked off. Castro watched nearly the entire protest from the sidelines before marching himself. Workers in all but essential services were given the day off and classes were cancelled for the government-organized rally. Normal public transportation was suspended, as buses transported demonstrators to the march site throughout the night. The case of Posada, who Castro has dubbed the "Osama Bin Laden of Latin America," is just one of the many thorny issues threatening already frazzled relations between the communist island and Washington. The U.S. government is trying "to force a break in the current minimal diplomatic relations with Cuba. The gross provocations undertaken by its Interests Section in Havana, doesn't have, nor can it have any other purpose," declared Castro to the cheering crowd filling Havana's seafront drive and adjacent thoroughfares. The latest irritant protested by Havana is an electronic news ticker, streaming human rights messages and calls for democracy in large red letters across the side of the American Mission virtually every night from 6 p.m. to midnight for the past week. The ticker was activated at exactly 8 a.m. local time, Tuesday just as Castro began to speak. "How brave the cockroaches are. Little Bush must have sent the order," declared an irate Castro. Among this morning's messages in Spanish was a quote from Abraham Lincoln: "No man is sufficiently good to govern others without their consent" and "If it's a battle of ideas (Castro's name for the ideological confrontation with the United States), why can't [people] disagree with their government?" Castro also accused the Bush Administration of pandering to Miami's hard-line Cuban exiles with a "macabre transition plan" for a post-Castro Cuba and moves toward violating the bilateral migration accord with the island. 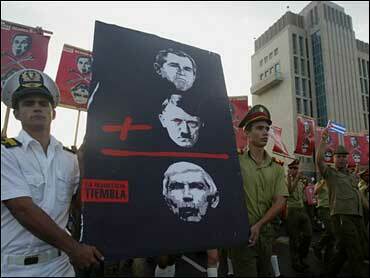 Billboards and posters went up on Monday along the march route comparing Mr. Bush, Posada and Adolf Hitler. One of the billboards read: "They want to free Posada" next to a photo of sobbing people, presumably relatives of the 73 on board the Cuban airliner that exploded in mid-air Oct. 6, 1976 off Barbados. Declassified CIA and FBI documents identify Posada as a former CIA agent and one of the "engineers" of that terrorist bombing. In 1985 Posada escaped from a Venezuelan prison where he had been jailed awaiting trial for the Cubana incident. He turned up in El Salvador as part of network run by Lt. Col. Oliver North of the Reagan Administration's National Security Council supplying guns to the Nicaraguan contras. Although Posada denies involvement in the plane explosion, he told the New York Times in 1998 that he was behind a string of Havana hotel bombings the previous year that injured 11 people and killed an Italian businessman. In 2000 he was arrested along with three other Cuban exiles in Panama with 33 pounds of C-4 explosives apparently intending to assassinate Castro during a student rally at the University of Panama. The four were pardoned in September 2004 and Posada disappeared. His three co-conspirators traveled to Miami where they were welcomed as heroes. Last March Posada illegally entered the United States from Mexico. He has been held in an El Paso, Texas immigration detention center since being picked up in Miami last May. Posada, 78, calls himself "a Cold War Warrior" and says he wants to spend the rest of his life with his wife and grown children in Miami. Peter Kornbluh, at George Washington University's National Security Archives has spent years getting CIA and FBI documents pertaining to Posada declassified. He sees Posada's presence in the United States as posing "a direct challenge to the Bush Administration's terrorism policy." The documents released so far, he says, leave "no doubt that Posada has been one of the world's most unremitting purveyors of terrorist violence."